The Enjoy Centre is not your typical greenhouse. 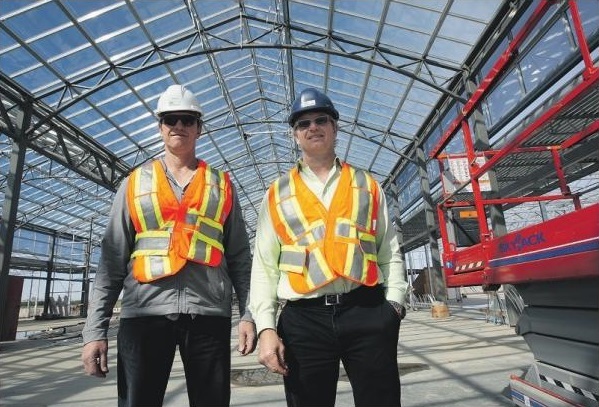 In fact, Dan Van Hoffen, the Building Operations Manager, describes it as a “lifestyle centre.” The Enjoy Centre is primarily a greenhouse, but includes a spa, liquor store, restaurant, deli and grocery store that all work in conjunction with the greenhouse. The Enjoy Centre is essentially a self-contained community with its businesses supporting one another. For example, the greenhouse grows products used by the restaurant, and the restaurant sources some of its meat from the deli. The greenhouse itself has some unique and state of the art energy efficient features. The building contains eight flood floors that allow it to water an entire section of the greenhouse at once. The water is then recycled into a holding tank. This has drastically reduced the labour required to water pots individually. The greenhouse also has moving lines hanging baskets hung on chains, each line holding 750 baskets, for a total of 6,750 baskets. The system is equipped with a sensor, so when a basket goes by, it is automatically watered. Finally, the greenhouse has a 600 litre rain water holding tank for irrigation. In terms of heating, the Enjoy Centre has in floor heating and cooling, and two boilers. The primary boiler has a cogeneration unit that acts as a backup and produces half to two thirds of their power requirements during peak daytime demand. Dan has greenhouses in his blood; his family owns them in Ontario. He has a degree in environmental science and also studied power engineering. His role is to look after the building itself and make sure all of its systems (heating, cooling, irrigation etc.) are running smoothly. He also takes care of maintenance contracts and oversees all of the contractors in the building. In May, the greenhouse hires a lot of people. There can be up to 300 people working in the building during the busy season. Dan sees the technology adopted by the Enjoy Centre gaining interest. He’s provided tours of the cogeneration unit to people constructing new buildings. He’s received calls from other greenhouses to learn about the hanging baskets and sub-irrigation. He’s seeing what used to be “novel technologies” become mainstream as costs drop. Cogenerators like the one the centre uses are typically manufactured by a company based out of the U.K. But now similar companies are opening offices in Alberta because of increased demand.